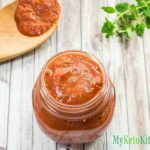 Keto Marinara Sauce Recipe - Low Carb & "Easy" to Make - Delicious! Marinara Sauces at the store are often filled with sugar, additives and thickeners, our Low Carb Marinara Sauce has none of those ingredients. But it does have plenty of flavor! In a saucepan, place the oil, garlic, onion flakes, thyme and oregano. Saute over medium heat for 3 minutes. Cool the sauce and store in an airtight jar in the fridge.